In the dog days of summer, there has to be a reason to want to be in the heat! Last Thursday night, August 4th, in New London, CT, was ACD’s reason to kick up their heels in the blazing sun and join the masses in their sweat and enthusiasm for dance! CT Ballet was celebrating their 30th year and we were invited to open the bill for them. With a cascading fountain and the downtown waterfront as a backdrop, the dancers turned up the heat with my new piece, “Itty Bitty Nitty Gritty,” a comedic trio inspired by three children’s chairs. The loud horns from the ships occasionally wafted by… a nice reminder of where we were! James, Milan, and new to ACD, Catherine Borrone, used every trick in the book to get a chuckle and put a new twist on a“another chair piece.” Has modern dance seen the last of them? I think not! I was so excited the night before at the Baryshnikov Arts Center when we finally finished the piece. My assistant and understudy, Sarah, came through for me, handling all the nitty grityy details, that I was too busy to take care of myself. Everyone needs a Sarah!! As is typical with us, we made another Jiffy Mix-dance, “just add water,” and off we went. It was really great using a piece of music from my childhood from an obscure band, The Audience. It was dream come true, finally using this music that I longed to use for so many years! In a suite of three pieces of music, this was the one that was like a steam roller — get out of the way!! The dancers danced it with ease and commitment, which was no easy task! The itty bitty things we often overlook are the smiles on the faces of children when they’re at play. 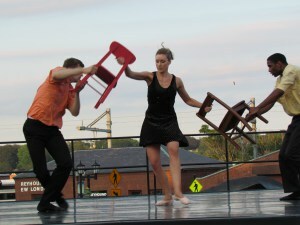 This dance made my inner five-year-old smile with three children’s chairs in use in high style. I still hear the playground sounds and the bell ringing — it’s time for milk and cookies — thanks for the fantasy, dancers!